The reigning US Open champ Samantha Stosur was long thought to have her best chance for major success on the red clay of Roland Garros. She was a 2010 finalist here, losing a match she was heavily favored to win to Italy's Francesca Schiavone. For all the talk of Stosur being a great claycourter, and this is her third semifinal at the claycourt major, she's only won one event on the surface in her career, back in 2010 on Charleston's green clay. The rub with Stosur is that despite her resume-defining major title, she's only won three tour level events (out of 14 finals). She's the bizarro Caroline Wozniacki, she can win a major, but not much else. 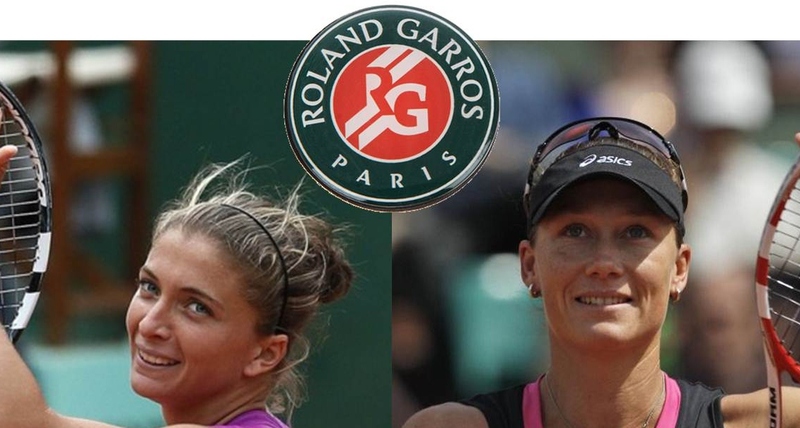 US Open title aside, Stosur came into Roland Garros completely under the radar. Losses to Venus Williams in Rome and Maria Sharapova in Stuttgart can't exactly be dubbed bad losses. For sure, her record in Roland Garros tune-ups was certainly stronger than her pre-Aussie Open campaign where she won a grand total of one match. To her advantage, she's been able to quietly sneak through the draw until now. She dispatched Elena Baltacha, Irina Falconi, 27th seeded Nadia Petrova and Sloane Stephens without incident to reach the quarterfinals. Once there, Stosur dominated Dominika Cibulkova 6-4, 6-1 to reach the penultimate stage. Italy's Sara Errani wants to fly her country's flag on stade Phillipe Chatrier during the women's final for the third year in a row...dynasty anyone? She has five career singles titles, three coming on the red clay this year. With singles wins in Acapulco, Barcelona and Budapest, plus big doubles wins this year in Madrid and Rome (partnering compatriot Roberta Vinci), Errani has some serious clay court bonafides. The 21st seeded Errani is no stranger to the later rounds of Grand Slam tennis either, she reached the quarterfinals at this year's Australian Open before her run in Paris. Errani has already survived a trio of dangerous players to get this far. She ended the run of Top 10 ranked German Angelique Kerber in the quarterfinal and to set up that date, Errani finished off 2008 and 2009 Roland Garros champions Ana Ivanovic and Svetlana Kuznetsova in the prior rounds. If that's not enough, Errani (the World No. 8 in doubles) and Vinci are also in the doubles final. It's safe to say that the 5'4" player from Bologna has passed every test that has come her way thus far. This is the more star-powered of the two semifinals. Whereas Stosur and Errani came through without a ton of fanfare, Sharapova and Kvitova opened their respective half of the draw staring down longtime No. 1s Serena Williams and Caroline Wozniacki as well as defending champion Na Li/Li Na. Thankfully for last year's Wimbledon finalists (Kvitova d. Sharapova) none of those nerve-inducing threats troubled either women. All three were bundled out of the tournament by lesser lights who found their magic pixie dust ran out before the final weekend. Sharapova played two seeds en route to the semifinal, No. 28 Shuai Peng in the 3rd round and No. 23 Kaia Kanepi in the quarterfinals....the Siberian Siren lost eight games between the two matches. En route to Paris, the reformed "cow on ice" announced herself squarely among the favorites for the Roland Garros title, winning the hardware at the Premier events in Stuttgart and Rome. Her only hiccup in an otherwise brutally efficient campaign, a scratchy 4th round, 3 set, 3 hour struggle with errors (and Klara Zakopalova). Sharapova hit 53 unforced errors in that encounter, nearly costing herself a spot in a women's tournament that looks dangerously as if it's hers to lose. We've seen this kind of "dream" scenario for Sharapova before though. The Russian was the prohibititve favorite both at this year's Australian Open (l. to Azarenka), and last year's Wimbledon, where she lost to her semifinal opponent Czech Petra Kvitova. Kvitova, at this Roland Garros has not faced another seeded player, all but miraculous given the murderers' row in her section. To get to a major semifinal, Kvitova has beaten Ashleigh Barty, Urszula (The Other) Radwanska, Nina Bratchikova, Varvara Lepchenko and Yaroslava Shvedova. Not exactly Serena, Caro or Na/Li, is it? That and she's already been pushed to a third set twice, by Bratchikova and Shvedova. The reality, it doesn't matter how you get to the semi, it just matters what you do when you're there. That said, man, the Czech loves a big stage! Last year, she won Wimbledon, then was all but on the back of milk cartons until the indoor season winning the WTA Tour Championships and helping the Czech Republic claim the Fed Cup. This year, the 4th ranked Kvitova hasn't made a tour level final, then suddenly, she comes to Roland Garros and she's in the final four. Kvitova's only even played two other semifinals this year. In Stuttgart she lost to Sharapova and at the Australian Open, she lost to...you guessed it, Sharapova. The head-to-head reads 3-2 Sharapova, but Maria retired from their match in Tokyo last fall, so in completed matches, it's 3-1 Sharapova. The Pick: There's been question of late about Sharapova's fighting spirit in the business end of majors. When a woman who was World No. 1 with three majors to her name drops two major finals to debutantes, we agree, the questions are warranted. Fact is, even then Sharapova didn't find trouble until the finals. Kvitova has been MIA since Australia and she has had a cakewalk of a draw thus far. We picked Sharapova to win this whole shooting match on day one, we don't see a need to amend our pick today. Should one could consider, 80’s was basically the time scale as soon as craze from hip-hop breitling replica it was basically all ‘cool girl’s’(not to mention boy’s much too! )#) fascination to enjoy a set of two gate knocker jewelry installing on their tvs and radio stations for example the hip-hop associates (it again didn’t situation a lot of whether they couldn’t pick up some of those creep strikes (‘windmill’, ’ spine flips’ and so) best suited! )#). Set of two some of those good sized rolex replica gate knocker jewelry makes most people take a look way more chic not to mention classy. Charcoal Swimsuit, Dark blue Swimsuit, Cooking with charcoal briquettes Swimsuit will most certainly be acceptable for various types of skin tone. Gate knocker jewelry haven’t wasted his or her's sheen as they are through fantastic call for to this day. Gate knocker jewelry will offer an extensive cost in accordance with whatever it again is made up of not to mention concepts wooden on. There can be doorknocker jewelry made up of old watches, gate iwc replica sale jewelry from silver antique, gate knocker earring from sheet metal or anything else, every different that has a original but still enticing have of the usb ports. Gate knocker jewelry aren’t obsolete and can also turn out to be comfortably used in an outstanding stow. And yet it’s in no way typically the 80’s nowadays, is that it? Intervals rolex replica uk and even though most people hunger very hard for the purpose of few of doorknocker jewelry, most people hardly ever get enough time to exit looking out for it again. There can be attractive much simpler ways to get a tvs and radio stations splendid with the help of gate knocker jewelry. One too, it could be that an awfully rolex replica people are who from ınternet sites.